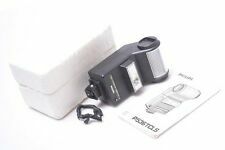 Philips 20B flashgun for rangefinder and SLR cameras. MINT- condition. Mint and MINT , or . In near perfect MINT- condition. Lenses would be optically clean. Lenses may have dusty and/or optical blemishes which shouldn't affect image quality. This is the lowest users grade. Sehr guter bis ausgezeichneter und voll funktionsfähiger Zustand! Mit Schiene und einem Blitzsynchronkabel;. PHILIPS PROFESSIONAL 46 THYRISTOR CL X P 546 G camera speedflash. Fully functional - no damages or missing parts - going also with camera bracket. Head spins 360 and tilt 0-90 - light can be bounced ll over the place. Good for groups shots or interiors photography. Thank you for watching. Dont expect to see crystal clear optics if you shine a torch through an old lens! This is a sure fire way to encourage fungi! Signs of light use. I will be away from 24th May until 7th June. Sorry for the inconvenience. 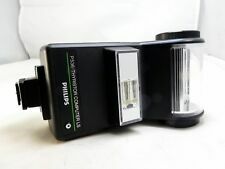 Philips flash 31CTB Camera Flash - great working condition. THE MOST IMPORTANT THING! This item is fully tested and is in Great Working/Optical condition. In einem gebrauchten Zustand, funktionsfähig mit leichten Gebrauchsspuren am Gehäuse. Foto Zubehör. Dia & Film. In einem guten Zustand, funktionsfähig. Abnutzungsspuren und kleinere Kratzer auf dem Gehäuse. Foto Zubehör. WORKS GREAT. EVERYTHING ON PICTURES. Interior zip pocket, cell pocket and open pocket w/ snap closure. interior key clip. Philips P536G Thyristor Computer LS Flash w/2 Heads & 5 A Modes & Power Divider. If you like stable working flash at any weather and lighting condition this flash for you. IN USED CONDITION FOR USERS ONLY. IF YOU ARE "COLLECTOR" OR. The upper head has swivel and tilt. Power source 4 AA batteries (not included). PHILIPS P536G-THYRISTOR COMPUTER L FLASH in MINT CONDITION. Rotating flash head from 0 degrees to 90 degrees. Manual or Auto Mode Switch. Off or Standby Mode Switch. Flash works good, all features work good. All buttons work good. It has no known issues. I would rate it at 8 out of 10. Flash looks good. Battery door has little bit of rust, but it still works good. I will work with you on resolving the problem. Alaska, hawaii. Band new, box opened. Item like new. Variable Power. Our goal is to provide you with a Superior Product and Excellent Service. If you have a problem with your item or feel that you can not provide. You will get the electronic flash in the pics. 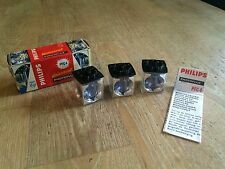 Philips P36 CTLS Flash Tested With 2 diffusers and instructions. Used working flash. Some corrosion on battery door does not affect performance. No cable included. Some tape marks on back panel. Phillips P536 Thyristor CL X powerful flash flashgun . Variable Power Flash is in good condition. Combined shipping available. 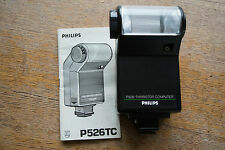 Philips 380 CTC Camera flash unit. Shoe mount flash. 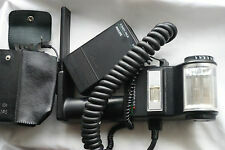 Philips 380 CTC Camera flash unit. Shoe mount flash. working. Combined shipping available. The flash is in very nice, mint working condition. Shows no signs of prior use. All functions checked and working. It has the universal hot show connection. Philips P36 CTLS Flash. Batteries compartment has bad corrosion. What you see is what you will get.